Reunion is on our bucket list of places to visit. 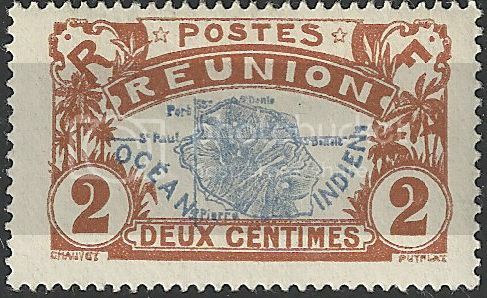 This stamp, which features a map of the island, is part of a pictorial set issued from 1907-1930. Hatay State was a short lived republic located on the Eastern Mediterranean coast on the border of Turkey and Syria. For centuries, the region was a part of the Ottoman Empire known as the Sanjak of Alexandretta (sanjak being an Ottoman administrative region). Occupied by the French in World War 1, the territory, along with Syria, became part of the League of Nations Mandate to France following the defeat of the Ottomans. The Sanjak of Alexandretta was an autonomous region from 1921 to 1923 until it became part of the Sanjak of Alleppo, and in 1925 became a part of Syria. The inclusion of the sanjak in the French Mandate was never accepted by Mustafa Kemal Atatürk, the leader of the newly formed Turkish Republic, who strongly felt that Alexandretta was a sovereign and historical part of Turkey. As threats of a second world war loomed across Europe, the Sanjak began separating from Syria in November 1937, looking more to France and Turkey for military defense. On September 7th, 1938, with a newly adopted constitution, Hatay Devleti (Hatay State) declared independence, and Turkish was declared as the national language, with French as a secondary language. Within months, Hatay had adopted all Turkish laws, made the Turkish lira as the official currency and even embraced a flag designed by Atatürk himself. This autonomy was short lived because on June 29, 1939, the Parliament voted to dissolve the state of Hatay and join the Turkish Republic. This process was finalized on July 23rd, when Hatay was officially added as a Turkish province. This was not done without controversy, as Syria disputed France’s right to cede the area to Turkey, and maintains to this day a claim to the territory. 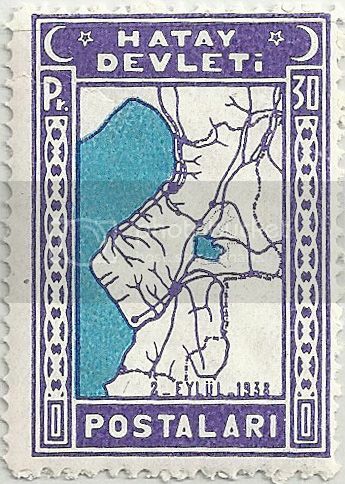 Part of a set of stamps issued in in 1939 which featured four different designs in 13 different denominations: a Map of Hatay, the Lions of Antioch (a beautiful pair of lion carvings from the ancient Hittites), the Flag of Hatay, and the Hatay post office building. That JanetC knows how to trade some colorful stamps. Not sure if anyone else mentioned this, but a collector in my Michigan stamp club brought in stamps that were printed on the backs of old maps! Would that fit in a collection of "map" stamps??? You must be talking about Latvia stamps that were printed on WWI German Military maps. 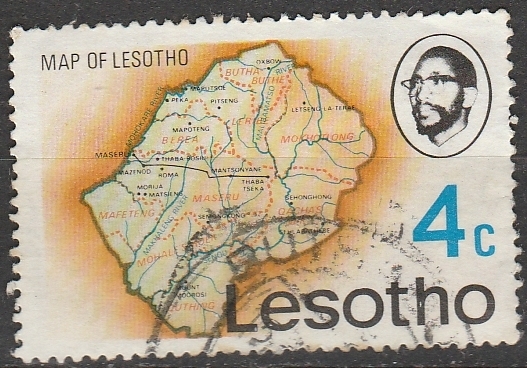 We have a thread that consist of things on back of stamps. You could post them there if you like. 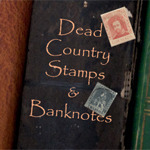 I think those stamps were Latvian or other Baltic countries. think of any "X" ones though! 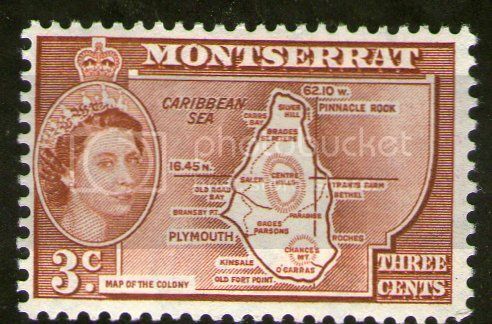 Hi everyone this stamp is the Map of the Colony of Montserrat, issued 1958.